The tendency of oxidation-reduction reactions is to proceed to an equilibrium state. These reactions occurring in electrochemical cells provide another way for us to express the driving force in chemical reactions. When reagents that accept or donate electrons are arranged so that the electrons can enter or leave the reaction through a metallic conductor, an electrochemical cell is established. A half-cell contains a metal in contact with a solution of its salt. 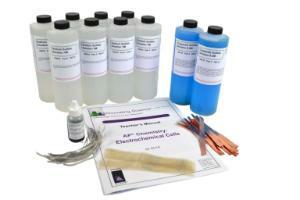 Each metal will develop a different electrical potential based on its electron configuration. The standard reduction potential listed in various references is the voltage that a half-cell develops when combined with a hydrogen half-cell. First, construct a simple chemical battery and determine from the standard reduction potentials what the output of the battery will be (if a voltmeter is available the actual and theoretical voltages can be compared). 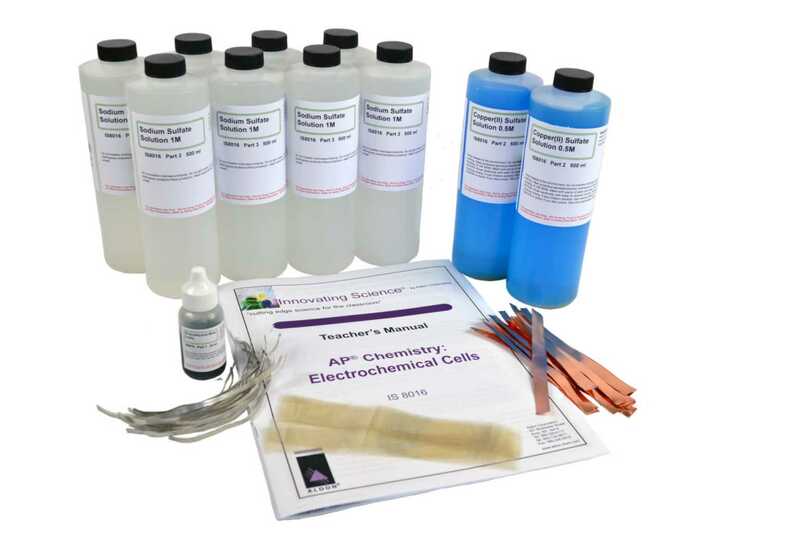 Second, construct an electrolysis cell and demonstrate how hydrogen and oxygen can be produced from the electrolysis of water. Ordering information: Includes Cupric Sulfate Solution, Bromothymol Blue Solution, Sodium Sulfate Solution, Copper Metal Strips, Magnesium Metal Strips, and Dialysis Tubing Strips.